It belongs to the Parliament House, designed by Imre Steindl. Built between 1883 and 1902, it is fairly shamelessly based on Westminster. 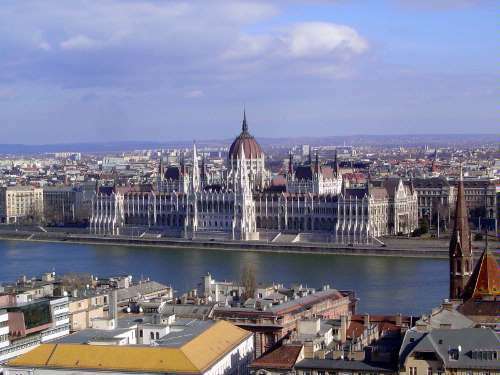 Why did Budapest get a parliament at all, when in those days it was the second city of the Austro-Hungarian Empire, headquartered in Vienna? It got one because a few years earlier, the Compromise (or Ausgleich or Kiegyezes) of 1867 granted Hungary a kind of independence. The Hungarians got their own parliament and ministers, while the head of state remained the Emperor-King, Franz-Joseph (Ferenc Jozsef in Hungarian). He kept the army, too. Oh, one more thing. You'll have to do without Hungarian diacritics here. Blame the software.